This weekend in Cleethorpes, we were absolutely delighted to win a Gold Medal in the very prestigious Champion of Champions category in the RHS Britain in Bloom 2013 finals. This is a fantastic achievement and many thanks must go to everyone who has helped over the year - volunteers, East Lothian Council, the schools and our sponsors. 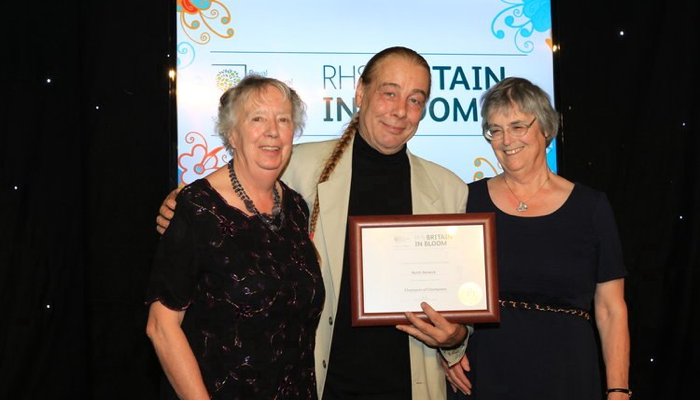 The photo shows committee members Elma Danks and Sheila Sinclair with presenter Bob Flowerdew at the awards ceremony. “Known as the Biarritz of the North in VIctorian times, visitors were attracted by the simple pleasures of healthy open air promenading and exercise and to North Berwick’s beautiful location. Today’s visitors enjoy added attractions such as the excellent Scottish Seabird Centre which through modern technology allows the uninterrupted observation of all forms of animal and bird life from the comfort of its pleasant and informative environment. presence all of which have been described as outstanding by judges over the years. school in winning three consecutive gold medals three years at Gardening Scotland.